VoIP Speed Test -- How Many Phones Can Your Bandwidth Support? VoIP Speed Test — How Many Phones Can Your Bandwidth Support? When using a VoIP phone service, the quality of your calls and how many lines you can support will largely depend on the bandwidth of your internet connection — the faster the better. For example, the average internet connection in the US has a 10 Mbps upload speed, which can support 22 VoIP phone lines comfortably. Use our VoIP speed test below to measure your bandwidth, then we’ll discuss what it means for your business’ ability to effectively support a VoIP phone service. RingCentral is a leading small business VoIP provider that offers unlimited calls to anywhere in the U.S. and Canada and can cost 70% less than traditional phone services. You can even keep your existing phone numbers. Click here try RingCentral free for 15 days. How Many Phones Can My Internet Connection (Mbps) Support? The faster your internet connection, the more VoIP phone lines it can support. For example, a 500 Kbps upload speed will support a maximum of five lines whereas a 10 Mbps upload speed will support a maximum of 100. The results of your speed test will give you two numbers: your download speed and your upload speed. Because you’re limited by the lower of the two numbers (which is almost always your upload speed), we’ll refer to that as your bandwidth. Multiply your upload speed by 1000. This converts the units from Mbps to Kbps, so if your speed is already expressed in Kbps then skip this step. Divide your result from step 1 by 445. This will tell you the recommended number of phone lines your connection can support. Divide your result from step 1 by 100. This is how many phone lines you can support in a perfect world where your internet connection was stable and consistent and no bandwidth was being used for other activities, like browsing or downloading. So using my upload speed of 11 Mbps, the recommended number of VoIP phone lines that my internet connection can support is 24 and the maximum is 110. Maximum vs. Recommended Number of Lines: What’s the Difference? The number of VoIP lines you can support doesn’t only depend on your internet speed. It also depends on how much of your bandwidth is available for VoIP use versus other uses like internet browsing, email, online software, web-based POS systems, etc. Our recommended number of lines takes into account these other browsing activities, as well as expected fluctuations in your internet speed throughout the day. Cable internet speeds tend to fluctuate, whereas newer fiber connections are more stable. You can learn more about different connection types in our guide How to Set Up Internet for Your Business. What Do The VoIP Mbps Speed Test Numbers Mean? Upload Speed – Your connection’s upload speed, measured in megabits per second (Mbps), is typically lower than your download speed because this reflects the actual bandwidth available to your computer. Download Speed – The maximum amount of data your connection can receive, measured in megabits per second (Mbps). In the rare case where this number is lower than your upload speed, then this is your actual bandwidth. Ping – The amount of time it takes for your computer to communicate with a server. On a VoIP phone call, this constitutes the latency (or delay) between you and the person you’re speaking with. Small delays aren’t noticeable, and a ping speed below 100ms is generally acceptable. Bandwidth is maximum rate at which your network can transfer data. And because VoIP technology transmits your voice as data, it’s one of the key factors in determining how many concurrent phone calls your internet connection can handle. Bandwidth is measured by your download and upload speed – that is, the rate that information travels to and from your computer. Whichever of the two numbers is lower is your bandwidth. Because most users download much more than they upload, most internet service providers (ISPs) design their networks to allow for faster downloads than uploads. This is why your upload speed is most likely lower than your download speed. Each VoIP phone call typically requires 100 Kpbs up and down – or 1/10th a Mpbs. So if your upload speed is 10 Mpbs, then your network can theoretically manage up to 100 VoIP phone calls at once. The actual number, however, is closer to 10 or 20 calls because of other bandwidth usage. Internet speeds fluctuate throughout the day. When there are more users in your local area using the internet, speeds can vary up to 21 percent, according to one study of broadband internet connections. Another factor is web browsing. If you’re using the same internet connection to check email, stream videos, or run web applications, then your VoIP lines will have to compete for bandwidth. Heavy internet activity (such as the concurrent use of email, YouTube, and Spotify) takes about 1 Mbps download per user. Fortunately, they don’t require nearly as much upload bandwidth, which is typically the more important factor for VoIP phone calls. The exception, of course, is if you do a lot of upload-intensive work such as sharing videos/graphics or collaborating on files. If so, then this number could be a lot higher for you. Delays aren’t usually noticeable on the phone unless they’re over 250ms, so if your ping time is below 100ms and the person you’re speaking with has a ping time below 100ms your ears shouldn’t perceive any delay. The reason we leave an extra 50ms for leeway is because of the delay the VoIP system takes to encode and decode the voice to and from data. If you have a small business, most broadband connections will give you more than enough bandwidth for VoIP calls. With an average upload speed of over 6 Mbps in the US, a typical connection can manage 12 or more lines without much challenge. Bandwidth allocation is when you specify which internet activities get priority on your network. In other words, you can allocate a certain percentage of your bandwidth to your VoIP service. Then when your network gets strained, it will prioritize your VoIP traffic by slowing other activities (like internet browsing, download/uploading files) before it slows your calls. To set up bandwidth allocation, you need to adjust the Quality of Service (QoS) settings on your router. You can usually do this online by going to the website of your router provider (i.e. Netgear, Linksys, D-Link, Cisco, etc.) and logging into your control panel, or search for “[Your Router] bandwidth allocation” on Google. Does My Choice of VoIP Provider Affect Call Quality? Yes. VoIP providers differ in how they handle your calls, such as how they encode your signal from voice to data. One of the biggest factors that can affect your call quality, however, is how many data centers they operate. Smaller companies who just have one data center, for example, may be prone to more issues when their network is strained. By contrast, larger companies can offer more reliable service by spreading their service out across locations. We recommend RingCentral as the best full-featured VoIP provider for small businesses. It’s one of the most powerful VoIP systems right out of the box, with a built-in conferencing system, support for up to 200 callers, and unlimited video and audio conferencing. Best of all, RingCentral offers live United States-based phone support 24/7 to help you get the most out of your VoIP service. Click here for a free 15-day trial. VoIP vs Landline: What’s the Best Small Business Phone System – Find out about the advantages and disadvantages of VoIP for your business with our comparison guide. 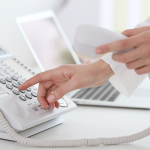 Best Business Phone Systems – Find out which phone system provider is best for your business. Things to Consider When Setting up VoIP Phone Service – Learn more about VoIP and everything you should consider when looking for the best VoIP phone service provider for your needs. Small Business VoIP Service: Who Is The Best – Check out our comparison reviews of our favorite VoIP service providers, with information on pricing and features. VoIP Service User Reviews – Read reviews from existing users and get the full story on how they feel about their VoIP service providers. Most broadband connections are well over the requirements to support 1-10 concurrent VoIP phone calls. With a high-speed business connection, that number can be much higher. Remember to check out RingCentral if you’re not satisfied with your current VoIP provider. You can have your whole office up and running in just a day. You also get unlimited calling and conferencing, toll-free numbers, and customizable caller ID and can easily make changes your phone system online. Click here try RingCentral free for 15 days. Thanks for the article. We are a coworking space and one user is having problems with his VOIP calls. (Phone and computer, video). Our Ping is 28, our jitter is 3. Download 280 and upload 41. He seems to be the only one experiencing consistent problems. (Though I don’t know that everyone else is on VOIP). It happens to him whether there are 5 or 25 people here. Do you have any insight as to what the trouble might be? Hi Anne, unfortunately, bandwidth is only one component that can affect the performance of a system. While it does sound like the issue is specific to your co-worker’s specific computer settings, the best course of action is to the VoIP service provider directly to diagnose the problem. Thanks a million for your helpful article. I have a very simple question here .. the VoIP provider you mean, is it the company which provides me with the software which will be used over the PC for the calls or you mean something else? And I’ve been dealing with VoIPStudio is it a good one? Yes, the VoIP service provider is the company that provides you with the phone service. You can access the service through software on your computer, or by using a VoIP phone. I’m not familiar with VoIPStudio, but will note it for future updates of the article. Thanks! I’ve used VOIP lines in my business and have never had any issues however recently our line quality has been terrible. We have two lines but only one is usually in use. 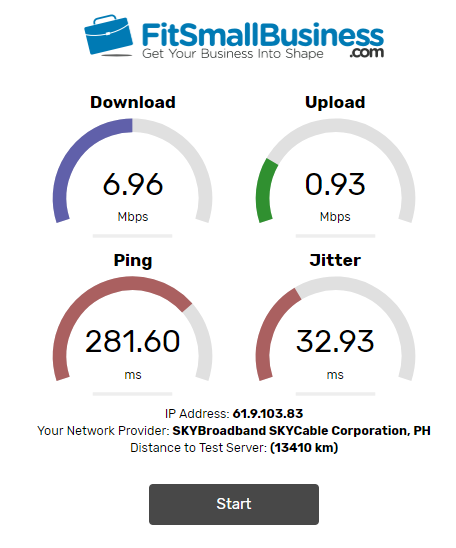 I’ve just done a speed test with the following results, ping 102, download 8.26 and upload 0.60. We haven’t changed internet provider do you think this could be the issue? Also the voip provider has had a staffing change and they seem all over the place, do we need to look for another provider for VOIP or speak to the internet provider? Your upload speed seems to be low. That might be affecting your VoIP performance. I would speak to your ISP to see if a better service is available; if not, then maybe consider changing ISPs. A few years back I would agree with the argument that VoIP service isn’t very reliable. Within that same breath I was dealing with a non working phone line with the copper phone company. At the end of the day there is going to be some sort of outage at some point. Business internet speeds are plenty fast now and should be sufficient for any small business wanting to use a cloud phone system. Helpful article. Especially appreciated the chart of speeds. However no matter how fast it all comes down to reliabiility. If the internet is down – as it can happen – no calls are coming in at all.